ROME—Amazon has acquired the Roman Catholic Church according to documents the E-commerce giant filed with the Securities and Exchange Commission last week. The acquisition comes in the context of financial distress signals from The Holy See as church membership has been on the decline as a result of scandal as well as long-term increases in atheism and agnosticism. Deep cuts in the Vatican Bank’s holdings will now require an angel investment to avoid bankruptcy. The Vatican Museum and St. Peter’s Basilica will be renovated into a warehouse for distributing Amazon’s European goods. Works of Art such as Michelangelo’s Pieta are being burned in the Sistine Chapel fireplace, sold, or remaindered. As a condition to the deal, Amazon CEO Jeff Bezos agreed to convert to Catholicism. 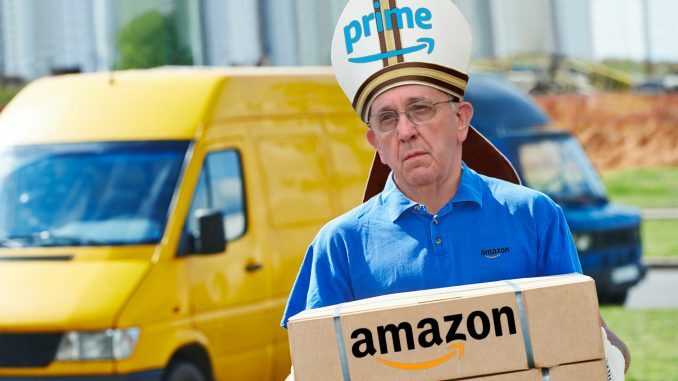 Pope Francis reportedly led Bezos through the Romans Road to Salvation. Pope Francis was unreachable for comment; the spokesman told us he was behind on his delivery quota of Amazon Fire HD tablets and AA batteries.